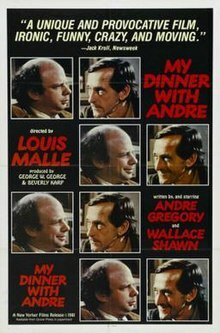 My Dinner with Andre is a 1981 American comedy-drama film directed by Louis Malle, and written by and starring Andre Gregory (Andre) and Wallace Shawn (Wally). The actors play fictionalized versions of themselves sharing a conversation at Café des Artistes in Manhattan. The film's dialogue covers such things as experimental theatre, the nature of theatre, and the nature of life, and contrasts Wally's modest humanism with Andre's spiritual experiences. Andre Gregory is the focus of the first hour of the film, when he describes some of his experiences since giving up his career as a theatre director in 1975. These include working with his friend, director Jerzy Grotowski, and a group of Polish actors in a forest in Poland, his visit to Findhorn in Scotland, and his trip to the Sahara to try to create a play based on The Little Prince by St.-Exupéry. He worked with a group in a small piece of performance art on Long Island, which resulted in Andre's being (briefly) buried alive on Halloween night. The rest of the film is a conversation as Wally Shawn tries to argue that living life as Andre has done for the past five years is simply not possible for most people. He relates ordinary pleasures, like having a cup of coffee. Andre responds that what passes for normal life in New York in the late 1970s, is more akin to living in a dream than it is to real life. The movie ends without a clear resolution to the conflict in worldviews articulated by the two men. Wally reminisces during a taxi ride about his childhood and mentions that when he arrives at home, he tells his girlfriend Debbie about his dinner with Andre. Erik Satie's Gymnopédie No. 1 plays in the background. I actually had a purpose as I was writing this: I wanted to destroy that guy that I played, to the extent that there was any of me there. I wanted to kill that side of myself by making the film, because that guy is totally motivated by fear. The screenplay went through numerous developmental changes in location; in the final version, it was set during a dinner at a restaurant. While Shawn was trying to find someone to direct the film, he received a phone call from French director Louis Malle. He had read a copy of the screenplay via a mutual friend and insisted that he work on the project, saying he wanted to direct, produce the film, or work on it in any capacity. Shawn initially thought that the call was a prank, due to Malle's stature in film. Malle later suggested that the dinner setup would not work, based on a rehearsal where Gregory was talking while eating. Shawn argued throughout screenplay development for more scenes, which would have resulted in a three-hour film. Malle won many script cuts, but lost two arguments over scenes that were kept in the film. My Dinner with Andre was filmed in the Jefferson Hotel, which was then vacant, in Richmond, Virginia. (The hotel has since been restored and reopened as a luxury venue.) Lloyd Kaufman was the production manager on the film, and Troma Entertainment provided production support. The filming was done over a period of two weeks, and edited to appear as if occurring in real time. The set was created to look like the iconic Café des Artistes in New York City. Roger Ebert and Gene Siskel gave high praise to the film on Sneak Previews; the producers told Ebert that their praise helped keep the film in theaters for a year. Ebert later named it as the best film of the year. In 1999, he added it to his Great Movies essay series. He said, "Someone asked me the other day if I could name a movie that was entirely devoid of clichés. I thought for a moment, and then answered, My Dinner with Andre." The Boston Society of Film Critics Awards ranked it as the "Best American Film" in 1982, and awarded Gregory and Shawn its prize for Best Screenplay. Throughout the film, Andre references his wife "Chiquita"; in real life he was married to Mercedes "Chiquita" Nebelthau, who died in 1992. Nebelthau was a documentary filmmaker whose credits include three films about Jerzy Grotowski, whom Wally and Andre talk about in this film. Throughout the film, Wally references his "girlfriend Debbie". Though not actually identified, Debbie is the acclaimed short story writer Deborah Eisenberg, although she had not begun publishing stories at the time of the film. Eisenberg is also an extra in the film, a dark-haired diner Shawn glances at as he scans the restaurant while standing at the bar waiting for Andre. One of the daily panels of The Far Side comic, by Gary Larson, features a person with a pie in the face beside a crazy person with a banana in his hand and a wine glass on his head acting stupidly, with the caption saying "My Dinner With Andy". 1983: My Dinner with Andre was parodied by Andy Kaufman and wrestler Fred Blassie in My Breakfast with Blassie. 1991: In the series The Simpsons third-season episode Homer Defined, there is a parody Itchy and Scratchy short titled "My Dinner with Itchy". 1991: The German art house horror film Nekromantik 2 features a film within a film that parodies My Dinner with Andre. In it, a man and a woman, both naked, sit at a table eating eggs and discussing birds. Director Jörg Buttgereit included the parody as a tribute to what he calls a "fascinating piece of film making". 1993: In the series The Simpsons, again, in the fifth season episode "Boy-Scoutz 'n the Hood", Martin Prince plays an arcade game based on the film. 1994: In the series Frasier first-season episode "My Coffee with Niles"; it featured a long conversation between Frasier and Niles, in which Frasier considers if he is happy with his new life in Seattle. 1997: In the Touched by an Angel fourth-season episode "My Dinner With Andrew"; main character Andrew is the Angel of Death, and he and a guest star talk in a restaurant, contrasting their views. 1997: The mockumentary film Waiting for Guffman, about the small-town production of a stage musical, contains a reference to "My Dinner with Andre action figures". 1998: In the series Frasier, in the fifth-season episode "The Zoo Story", Martin inadvertently watches the film after mixing up his rented video with Niles, who by contrast watches Death Wish. 2000: Excepts from the film appear on the American punk band Strung Out's EP, The Element of Sonic Defiance. 2011: In the Community second-season episode "Critical Film Studies": Abed invites Jeff to dinner and they have a deep conversation; later it is revealed Abed was trying to recreate the film. 2014: The Family Guy thirteenth-season episode "Brian the Closer" features My Dinner with André the Giant, in which André, who had gigantism, complains that he's wasting his shortened life on Gregory's mundane discussions. 2017: In the Nirvanna the Band the Show first-season episode "The Buffet", the opening scene shows the main character mimicking Wally's actions from the beginning of the film, walking on the city streets, waiting for a subway, and putting on a tie before entering a restaurant. Richard Linklater is a big fan of My Dinner With Andre and considers this film to be a big influence on his own work. ^ "My Dinner with Andre (A)". British Board of Film Classification. April 6, 1982. Retrieved November 24, 2016. ^ Box Office Information for My Dinner with Andre. The Numbers. Retrieved July 27, 2017. ^ a b Rabin, Nathan (April 1, 2009). "Wallace Shawn – Film – Random Roles". The A.V. Club. Retrieved July 4, 2012. ^ "WHEN NOAH MET WALLY – From the Current – The Criterion Collection". Criterion.com. Retrieved July 4, 2012. ^ Make Your Own Damn Movie! : Secrets of a Renegade Director – Lloyd Kaufman, Trent Haaga, Adam Jahnke – Google Books. Books.google.com. Retrieved July 4, 2012. ^ Andrew J. Rausch, Michael Dequina (February 25, 2008). "Lloyd Kaufman". Fifty Filmmakers: Conversations With Directors from Roger Avary to Steven Zaillian. Google books. pp. 118-. Retrieved July 4, 2012. ^ SPIN – Google Books. Books.google.com. Retrieved July 4, 2012. ^ Barnes, Mike (April 4, 2013). "Critic Roger Ebert Dies at 70". The Hollywood Reporter. Retrieved April 4, 2013. ^ "My Dinner with Andre." Chicago Sun-Times. ^ a b "Mercedes Gregory, Film Maker, Dead; Documentarian, 56". The New York Times. February 12, 1992. Retrieved April 10, 2014. ^ Taubin, Amy (2009). "My Dinner with André: Long, Strange Trips". The Criterion Collection. Retrieved January 27, 2018. ^ "GameSpy.com – Review". Archive.gamespy.com. September 12, 2003. Archived from the original on May 25, 2011. Retrieved July 4, 2012. ^ "Nirvanna the Band the Show: the Interview". Brief Take. March 16, 2017. Retrieved May 4, 2017. Roger Ebert (1981). "My Dinner with Andre". Chicago Sun-Times. Roger Ebert (1999). "My Dinner with Andre". Chicago Sun-Times.